In my last blog I explained the daily activities of an Above Store Reporting System, and the operational characteristics that define this style of restaurant performance management. In this entry, I will define an alternative approach to measuring the performance of your restaurants - Enterprise Data Warehousing (EDW). The term enterprise data warehouse comes out of the 1990’s, and according to Wikipedia, “is a system used for reporting and data analysis.” The EDW data may include in-store systems like POS or BOH, but can also include General Ledger, Payroll, HR/Training, customer feedback, reservations, loyalty, mystery shopper, or any other data systems. The objective of an EDW is to create a single repository for all of your key data. Without an EDW, companies are left to collect their data across multiple sources. Once the EDW is updated, the processes for reporting, distributing the data, and analyzing it for new insights begin. A key benefit of many EDW is the ability to analyze the data in an ad hoc manner through a user-friendly report writer. Being able to study the data in unstructured ways gives many companies new insight into their performance that traditional reporting is not prepared to deliver. While an ad-hoc report writer is not always a piece of an EDW solution, it is a key point of difference between traditional above store reporting and EDW. Armed with a report writer, a restaurant company can use data mining techniques to find new and powerful insights on the company's performance, and what their customers think of them. The philosophy of an EDW recognizes that data is constantly being collected across multiple sources, and realities change every minute. Reporting and analysis, in this world, is an ongoing process more than a daily project. An EDW, properly designed, accepts all of your data, whether it comes from Operations, Marketing or Finance, or from inside the restaurant or outside. And, an EDW design should make it far easier to add sources of data when the business adds a new system. An EDW, properly designed, expects to receive the lowest level of detail available from the source system. From an analytic perspective, summarized information is much less valuable than more detailed, or granular, data (referred to as ‘Facts’). 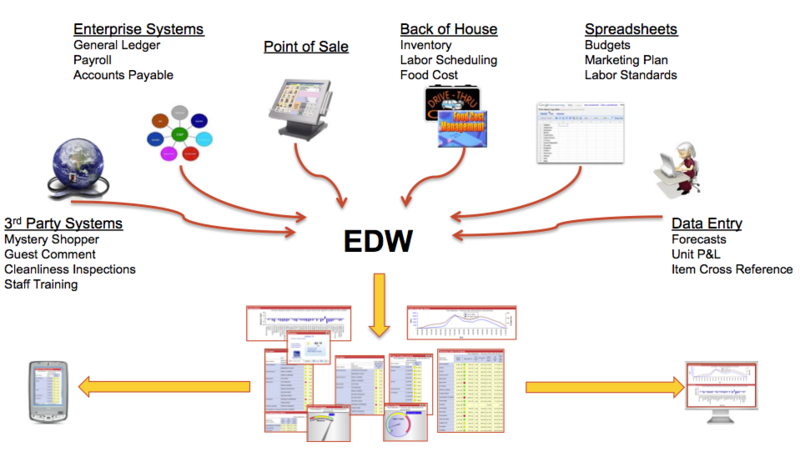 An EDW is built for analysis in addition to simple management reporting. Where reporting addresses the need to understand ‘What’ happened yesterday, the analytic nature of an EDW allows you to understand more deeply ‘Why’ the results were what they were. Do you currently use an EDW? If so, what are your thoughts about the solution method? If not, why? Is it a cost issue? Using spreadsheets? Learn more about restaurant custom reporting. Download an informative PDF. Mirus provides decision makers across operations, finance and marketing with actionable intelligence. Our analytic software consolidates transactional information and a host of other data sources to measure and improve restaurant performance. Headquartered in Houston, Texas, Mirus is a recognized leader in restaurant business intelligence. Take the short survey below to get a custom solutions report.